As we discussed in the opening article last week (Part 1), many candidates fail to give sufficient thought to questions they could ask an interviewer. These questions can either enhance their standing, provide them with an insight into their weaknesses, throw new light on the job, or broaden their perspective on the client and/or the job. By selecting three to four of our Part 1’s suggestions, any candidate can arrive at an interview with a much improved arsenal of questions at their disposal. 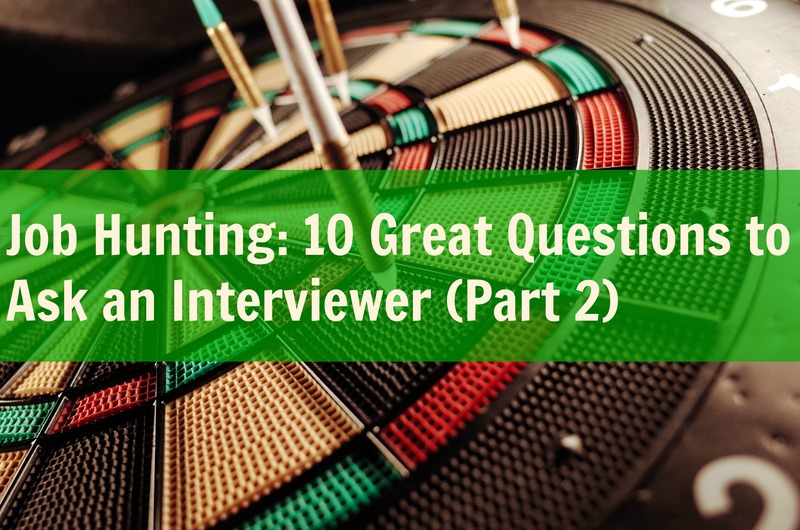 Part 2 of 3 will further examine excellent questions to ask at an interview. What does your company offer that others do not?The answer to this question be little, or nothing – but this is good to know. Most companies are similar in the package they and their competitors offer. However, there can be truly huge variations in this area. This question might reveal some hidden facts, great bonuses, frequent incentive trips, or even stock options that not known prior to the interview. It might reveal new critical advantage in a product or service that competitors do not have. What are the things or attributes that I will need to be successful in this next role?This gives the interviewer the opportunity to talk about the daily duties, personality traits, skills, and tools needed to do the job to a high level of satisfaction. It may also highlight the need for training, or the learning curve needed to do the job well. All of this information will guide a candidate’s decision. How will my performance be evaluated?This question will tell you how organized the company is, and how committed are they to consistently grading their staff’s performance. It may also show the career path to the next level, and whether bonuses or recognition for achievement will be arbitrary or based on merit. How does your company show their appreciation to their employees?Some companies show no appreciation to their staff. You have a job, we pay you, end of story. However, for many companies, showing a level of appreciation is woven into the corporate culture. Appreciations does not need to be a trip to the Caribbean (although we could all get behind that idea). What accomplishments are expected in the first, 30-60-90 days of this new role?The framing of this question provides the interviewee with a clear insight as to what are the expectations, and whether these are realistic or not. It also acts as a benchmark for the prospective employee to measure themselves against, should they get the job. How supportive is senior leadership of department led initiatives? It is nice to know if the top-flight management support the projects in any department. However, the answer to this question requires scrutiny: any waffling, evasion, failure to engage in eye contact, unusual scratching or touching of the face by the interviewer could mean the exact opposite. Steer clear of companies where the answer is that projects are regularly cut, postponed, not fully implemented, or do not get the full support of senior management. Those issues will not go away. What is the typical career growth path for a person entering in this position?Another good question to find out if this is a dead-end position or whether it has real growth potential, or if it lacks direction. Organizations that cannot clearly lay out future prospects either lack them and are so muddled that their paths are unclear. What happened to the previous person that held this position?It may be a bit of an awkward question – however, this will force the interviewer to give you some home truths about the job. This could raise red flags or leave you feeling good about the job. Equally, it may point out issues that can be dealt with through training or hard work. (For Sales related roles) What percentage of staff typically go on to be successful?Be prepared for a low figure. The reason being that most sales jobs are difficult. If they were easy, everyone would do them and we would all be successful. In reality, most people understand that there is a level of attrition in any sales related role. There are some caveats to this question. If the percentage is high, why is this the case? Does the product sell itself? Is it new? Is there a cornered market? If the percentage is low, dig deeper. What is the training like? How many competitors are there? How does this product compare in price? What would you need to get noticed for an above average performance?This type of question flags the interviewer that you are an ambitious person, looking to progress your career. It also gives you the standards you will need to outperform to achieve your personal goals. For additional advice on landing great jobs, read our additional FAQ posts or visit our blog. Original article written by Michael Williams, CEO, Global Healthcare IT, Inc.
Primary contributors: Brett Kolarik, Recruiter, Global Healthcare IT, Inc.; Lori Pieper Recruiter, Global Healthcare IT, Inc.; Sarah Fuller, Account Manager, Global Healthcare IT, Inc.; Bettsy Farias, Business Analyst, Global Healthcare IT, Inc.